but I reeally need to understand how to calulate these PERT related questions easily and fast. Or In the following question, the answer is 84.1%, how you calculate this? Project A has an expected duration of 48 days and a standard deviation of 4 days. When you get questions like this it is important not to panic and assume there is some fancy mathematical formula that you have not heard of. 1) This is a question about the Normal Distribution curve. The expected duration of 48 days is the Mean of the distribution. 50% of the population falls below the Mean and 50% above. Therefore the probability of completing the project in 48 days (the Mean) is 50%. 2) Same Normal Distribution; 48 days is the Mean and one standard deviation (1σ)is 4 days. So completeing the project in 52 days means completing it within +1 standard deviation of the Mean. One of the things that you should memorize for the exam is percentages at +/- 1, 2, 3 and 6 standard deviations of the Mean. 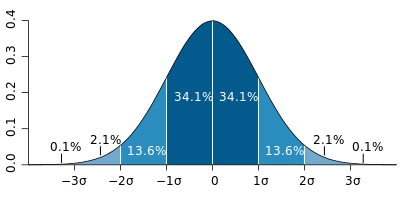 For the Normal Distribution, 68.25% of the population is contained within plus and minus 1 standard deviation of the Mean. Or put another way, 34.125% of the population lies within minus 1 standard deviation and the Mean and 34.125% of the population lies within the Mean and plus 1 standard deviation. As we already know that 50% of the population lies below the Mean then the probability of completing in 52 days (Mean + 1 standard deviation) is 50% + 34.125% or 84.1% (rounded). Thanks for the explanation; I really appreciate it. I understand that we can use the Normal Distribution curve to solve these questions. But Is there any way to calculate the results? The probability of a Normal Distribution can be calculated, but there are some pretty scary mathematical formulas you need to use. Or the probability can be approximated by using various mathematical power series (e.g. Taylor series) but these can be cumbersome to use. To make these calculations easier, most statisticians will use pre-published "Z-score" tables which contain a whole range of probability values based upon the Standard Normal Distribution; i.e. has a Mean of 0 (zero) and standard deviation of 1. The tables are a bit like using logarithimic or trigonometric tables, if you remember these from high school. From your original 2 questions (lets focus on the 2nd question), m = 48 days, σ = 4 days and X = 52 days. So a value of 52 days on your distribution is equivalent to a standard deviation of 1 (your calculated Z score) on a Standard Normal Distribution with mean of zero. This allows you to look up the probability in the Z-score table, which for Z-score of 1 is 0.34125. (* see below). As 52 > 48 (the mean), then probability = 0.5 + 0.34125 = 0.84125 or 84.1%. * a little confession, I never actually looked in a Z-score table for this value, as I already know that the probability of a value between minus 1 and plus 1 standard deviations of the mean is 68.25% (or put another way, 34.125% for values between minus 1 sd and the mean and 34.125% for values between the mean and plus 1 sd). If the Z-score turned out to be something other than 1,2 or 3 then I probability would have to resort to the tables. In the exam I would not expect the calculations to involve anything other than exactly 1, 2 or 3 standard deviations so you need to memorize these values and understand the basics of the Normal Distribution (see diagram above). Any other values would require access to Z-tables and/or a fairly sophisticated programmable calculator, neither of which are allowed in the exam. Apologies for the length of the post and I hope it makes sense and is useful. Very much helpful; thanks Graham.